Iron castings are produced in molds made out of sand bonded with resin and shaped by wrapping the desired pattern with the resulting mix, either manually or using automated or semi-automated machinery. The iron casting process makes use of sand cores to produce intricate part shapes or hollow parts. Iron castings are used across a broad range of industries such as the automotive industry where iron casting is used for the engine block, in agriculture where much of the heavy machinery is produced in cast iron and in the production of rolling mills. The most obvious characteristics of iron casting are its lower melting point than steel casting which makes it cheaper to produce, its good wear resistance, its excellent machinability (with the exception of white cast iron); its tensile strength (which does vary for the different types of iron castings), and the ease with which intricate designs can be produced. Whereas the first iron castings date back several centuries BC, the modern element composition of iron casting is a much more recent invention. Today, a number of different types of iron casting are produced; each one of them is classified by its graphite morphology which is a direct result of the melt inoculation methods used and the resulting solidification rates. Grey Iron Casting also known as lamellar graphite iron casting which is produced from pig iron (scrap iron or steel is often used too) and carbon and is economical to produce because of its low melting point. The principle elements of grey iron are carbon, which gives it its lamellar graphitic microstructure, and silicon. The combined effect of the two elements on the microstructure is known as the carbon equivalent (CE). Two other essential elements are manganese and sulfur which have their own optimum ratios established for high quality grey iron. The flaky nature of the graphite gives grey cast iron a lower ultimate tensile strength (UTS) than other cast iron types but gives it a higher thermal conductivity. Grey iron casting has virtually no elongation. Although it is possible to heat treat grey iron castings, they are mostly used in their as-cast condition. 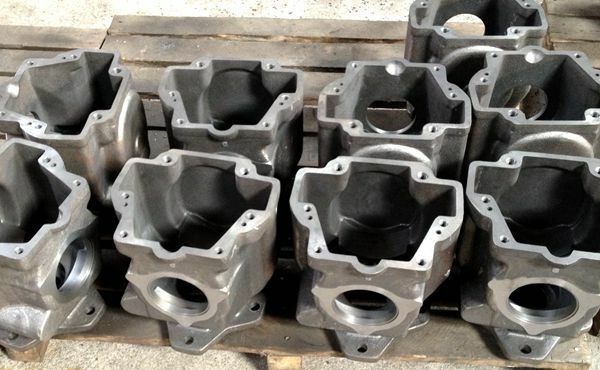 Application of Grey iron casting: Automobile engine blocks & heads, manifolds for internal combustion engines, gas burners, machine tool bases, cylinder liners, intake manifolds, soil pipes, counter weights, enclosures & housings, ect. Ductile Iron Casting which uses a carbon equivalent ratio that produces spheroidal graphite, which causes less surface tension than lamellar graphite, and has a dampening effect on tensions. Ductile iron has superior material characteristics to grey iron with the added benefit of its ductility. Its production requires the addition of some rare earth minerals. As the graphite precipitates during the solidification process ductile iron expands slightly. Application of Ductile iron casting: Steering knuckles, gears, automotive & truck suspension components, brake components, valves, pumps, linkages, hydraulic components, wind turbine housings, ect. CFS foundry, one of the largest iron casting companies in China, devotes itself to produce small to medium iron castings with machining capabilities. We specialize in the most common kind of iron castings at our foundry, especially grey iron castings and ductile iron castings. You will find our iron castings in places like mines, oilfields, heavy-machinery, and all sorts of transportation. Why are CFS iron castings so popular? Sometimes you can save more than 50% casting a part instead of fabricating it, and casting iron will ensure the precision you need, which cannot always be promised with fabrications. The general rule is the more complicated the piece, the more you will save by having your part cast. We can also help specify the material and the casting process (sand casting or lost foam casting) that would best suite your part, whether you need something that is impact resistant, has an extremely long wear life, or needs high tensile strength, we can tell you what will be the optimal material and process for your iron casting. A well-designed mold is the key to a well-designed casting. Where to put things like the gates and vents can dramatically affect the cost, quality, and aesthetics of your parts. Since we are the end manufacturer of iron castings, we well know how to best design molds for your parts and even what type of molds to use (like green sand or precoated sand casting molds). Looking for iron casting service in China? Contact us right now!